Last year before I started blogging properly I published a weekly update of how my daith piercing was helping my migraines. I'm sure none of you have ever seen those posts so I'm going to go from the beginning and catch you guys up! 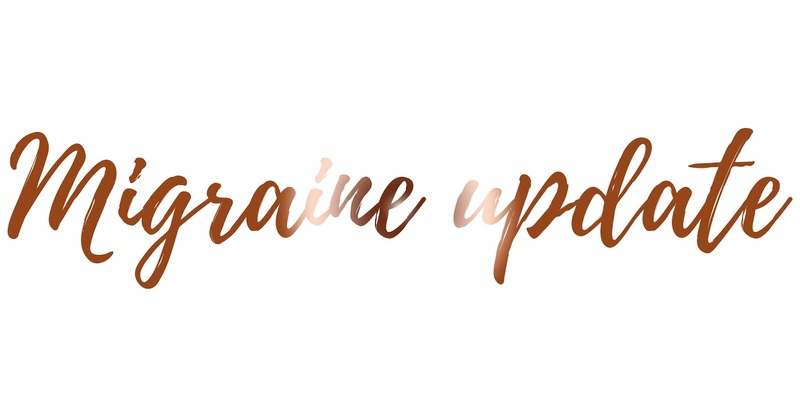 But I wanted to share an update with you of how my migraines are and whether the daith piercing made a difference in the long run. So I have suffered with headaches and migraines for around four or five years now, on a daily basis. Back in February 2015 I was asked by the most incredible brain doctor near where I live to create a pain diary of how bad my headaches were every single day on a scale up to 10. I also had to write a scale of when I was on my period and whether I took any pain killers to help my headache on each day. While doing this, I also had to come completely off co-codamol which I was taking four times a day, two tables at a time. And I was only able to take paracetomal or ibuprofen up to ten times per month, but ideally not at all. So I done everything he said, I didn't have any pain killers apart from if I had insanely bad period pain and needed to take them. And I wrote my pain diary for a year. In February 2016, I had my daith pierced to see if it would release the pressure and stop my headaches and migraines and for a while; it actually worked. I either didn't have a headache or my pain scale was below 5 whereas it was always a 9 or 10 beforehand. However, it has now been over a year since I had my daith pierced, and it's been over two years since I stopped taking co-codamol on a daily basis. But I'm now back to daily migraines, for the past week I've had one and they're driving me absolutely insane again. Last night I was completely reluctant to write this blog post because of how much my head hurt, but it needed to be done so I did it! And then went to sleep of course because the pain makes me feel so incredibly tired and sick. Sometimes I wish there was someone who could make these headaches and migraines just go away. Or for someone to tell me why I even get them. It has nothing to do with my eyes and nothing to do with my brain so what is it? To begin with they said it was stress, but is it? Really? I just want to know. If anyone knows of anything which takes away the pressure of headaches or migraines without taking medication, I would love to know! Because I've had enough of suffering with them now. Completely understand this!! I suffer with migraines (not as often as you) but can go through periods of having about 20 in two weeks and and as soon as I get rid of one my vision goes and another is on the way. The doctors have done every scan/test possible and its so frustrating that theres so many things that can bring them on because how can you possibly rule everything out!! Do you experience any pre-migraine problems? My vision goes blurry, my speech slurs and all one side of my body goes completely numb it is the strangest feeling! Hoping you can calm this down as I really do know how terrible they are!! Thanks for sharing this! I've suffered with migraines for the good part of 6 (maybe more!) years so I 100% understand how you feel. It can be disheartening but preserve and you'll get there.